Another linky party is here! I came across a linky party over at Go Fourth! With Mrs. Owens. 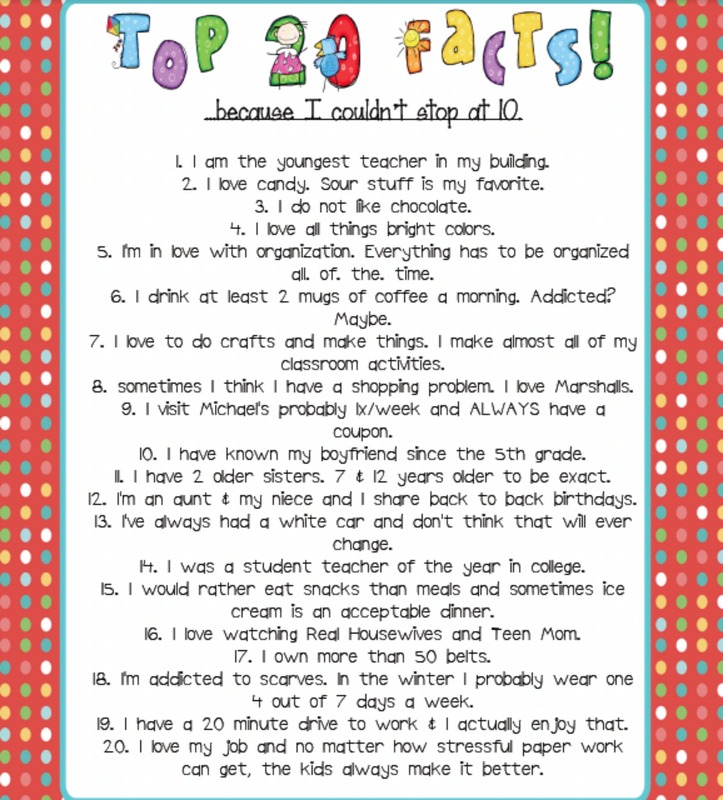 I love her idea...a top 10 list about yourself! I had so much fun reading everyone else's that I JUST had to join in! I'm a little disappointed with the quality of my document here. It really is so much cuter than it is showing up here. I use a program called inkspace and then I do all of these other crazy steps to ultimately turn my document into a photo, but in order to be able to read this one I felt like I lost some of the quality. (AND some of the cute red polka dot background!) I would LOVE to learn how to uplaod documents into my blog post. If you know how, help me! Please! **EDIT: I got help! and I learned how to upload a document!! Thanks so much Mrs. Morris! Now, you just have to ignore the blank 2nd page. But.. back to the linky party! I was having fun making my list so I kept going up to 20! Who doesn't love to read about other people? I know I do! I also loved when I found things in common with someone or, when two people had the same unusual things on their list. For example, TWO people mentioned they didn't like the word "moist"! hahah I can relate, I have words I don't like either! Let me know if you link up to the party! I can't wait to read more Top 10 Lists!! You should check out Scribd for adding documents. Upload, then click on the document, on the right hand side click on the embed button. It will give you the code to post in the HTML part of the post. That sounds pretty simple I'll have to check it out!! Thanks for sharing!! Thanks for joining in my linky party! I am a follower of your blog now! OMG! I love that you made a top 20 list..why didn't i think of that?! ?